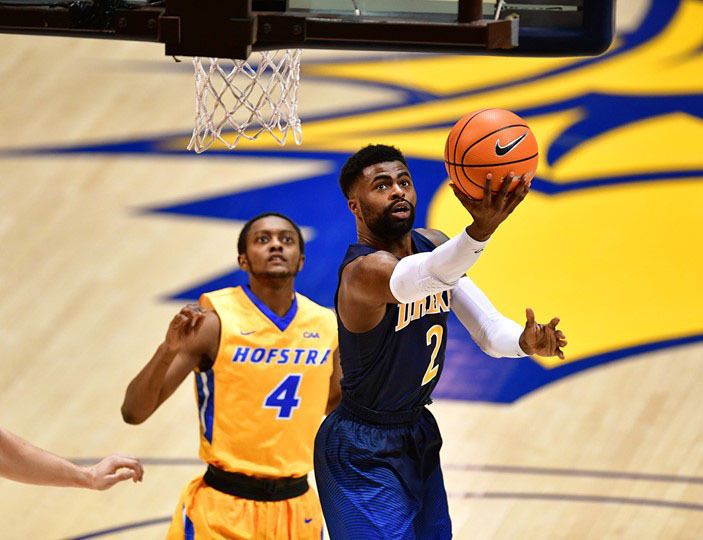 The Drexel University men’s basketball team lost to Hofstra University Feb. 17 but came back to defeat the University of Delaware Feb. 22. (Photograph courtesy of Greg Carroccio). The Drexel University men’s basketball team dropped their fourth game straight after back to back losses to Northeastern University (14-8 on the season) and Hofstra University (17-11). The first loss came Feb. 15 to Northeastern, where the Dragons lost by a score of 75-69. Despite the loss, junior Tramaine Isabell showed up to play as he scored 24 points and five rebounds. Junior Vasa Pusica went off in the first quarter for Northeastern as he scored 17 points to help the Huskies have a 10-point lead at halftime. In the second half the Dragons were down by as many as 14 points. Then, Drexel went on a 15-4 run of their own to cut the lead to three, with two and a half minutes left. Unfortunately, Northeastern then pulled away after Pusica hit a three and free throws after that. Drexel traveled to Hempstead, New York, to play Hofstra University Feb.17. The first half of the game belonged to the Dragons as they were up by two at the break. Isabell was a catalyst for the halftime lead as he shot 6-11 in the first half. After scoring 29 points in this game, Isabell is now averaging over 20 points on the season. While he was very impressive, so was Hofstra junior Justin Wright-Foreman who had 32 points. Drexel knew they would have their hands full with Wright-Foreman as he is the fifth in the country in points per game as he averages 25. Drexel also had to deal with Hofstra senior Rokas Gustys, who had 17 rebounds in the game and is ranked third in the country for rebounds as he averages 12. Hofstra dominated the Dragons in the second half as the final score was 88-76. Drexel is now 12-18 on the season and have one game remaining. They played the University of Delaware Feb. 22 and won 85-83 after a slow start in the first half. Drexel’s last game of the season will come against the University of North Carolina Wilmington Feb. 24.